'Mrs Echidna's Dilemma' is welcomed as a 4-in-one resource be teachers. The content fulfills the requirements of the Australian National Curriculum, particularly in Years P-3. For a synopsis, click here. 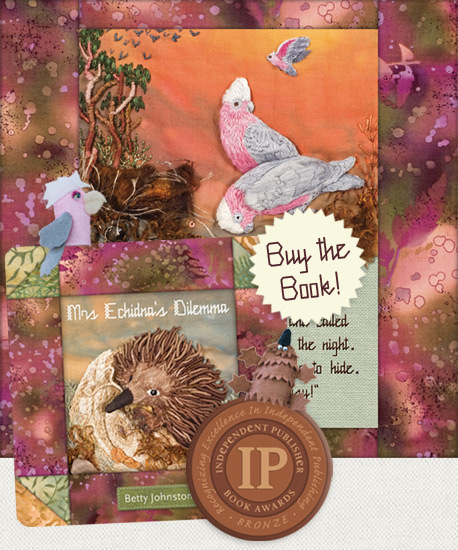 Mrs Echidna's Dilemma won an IPPY (Independent Publishers) award from USA in May 2011. The second edition of this book, released 26th September 2011, contains updated information from recognised echidna research scientist Dr Peggy Rismiller OAM. Mrs Echidna's Dilemma is a children's story (suitable for 3-8 years) with broad appeal. Educators are drawn to the animal science within an integrated literacy unit, while quilters and embroiderers are fascinated by the hand-stitched illustrations. The story, written and illustrated by Betty Johnston, was first embroidered on companion quilts. The tactile nature of the original art work is maintained in the book by embossing on the pages - the children can feel the contours of the animals and environments encountered. The children's involvement in the story is further encouraged by the inclusion of a DVD, and also patterns for you to make finger-puppets of Australian animals. Children love them! The questions that inevitably arise as you read the story, such as: ‘How does a kookaburra find its food? What do you call a baby echidna? Where does a platypus live? Why is the blue-tongue on the rock?' are all answered on the opposing pages, which give additional information to extend knowledge and understanding of these unique creatures. Although the tale was initially written for young children, the illustrations are a great source of inspiration for their parents and grandparents! The story quilt was hand-stitched in ‘stump work', or three-dimensional embroidery, using a wide variety of textures, threads and stitches - each panel features a different technique. The companion quilt was hand-worked in a modern adaptation of ‘black-work'... it's a bit like sketching, but with a needle and thread! Due to popular demand we have created a series of embroidery patterns based on the book, you can find out more about the packs and buy them here or at quality needlecraft suppliers across Australia. Easy to complete pattern packs are also available for early childhood education resources, including finger puppet sets and more immersive story dioramas. These resources have been tested with success in an early learning setting. You can purchase the pattern packs here. Thank you Betty. All the Prep children and teachers loved your visit and your story. Thank you for the love and passion you have! What a dilemma Mrs. Echidna did have and I congratulate most sincerely in the way you have portrayed this through your craft and journalistic skills...I am a "crafty" person with many patchwork quilts under my belt...and gave your book... to our grand children in US. I would like to thank Betty for presenting at our Book Week Family Night. The school community enjoyed hearing about the process an author goes through to produce and have a book published. Students are still asking for and enjoying Mrs Echidna's Dilemma. On Friday 14th May, Betty visited the Child Care Centre where it all began - and took the book 'Mrs Echidna's Dilemma' with her! Betty is available for book readings at your local library, school or child care centre. Contact her on this website for more details. Betty was the guest at Caboolture Sewing Machines and Patchwork Store, showing the quilts and sharing how they were created.